Feel free to open your command prompt and favorite text editor before we get going. The last section walks you through some hands-on activities. These exercises assume some familiarity in working with command-line tools and some basic knowledge of Linux system administration. You can get by without much of either. First, what problems are containers attempting to solve? One of the primary objectives of containers is to normalize the environment applications run in. The feared "it works on my machine" bug is a product of some of the challenges of having environmental differences between development, testing and production. Containers provide one avenue to smooth out those differences. If you’ve ever worked with a tool like Vagrant, you’ve seen a similar solution in action. The difference is that Vagrant is oriented around standing up a complete Virtual Machine (VM), whereas container solutions stand up much smaller virtualized systems in a host environment. You can see in these diagrams from Docker that VMs have a few more layers than containers, including the hypervisor and guest operating system. Most issues with performance in VMs stem from the heft of these two layers. You can see in the following diagrams that replacing the hypervisor and guest operating system with Docker Engine results in a leaner tech stack. Figure 1. Differences between virtual machines and containers, source: What Is Docker? The biggest benefit to the difference in virtualization strategy between VMs and containers is that containers are lighter, faster and leaner than VMs. 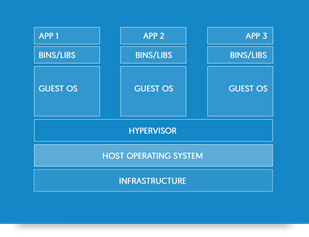 Containers share the host kernel rather than running separate kernels on top of the hypervisor. When you install Docker on your machine, you install the Docker Engine virtualization layer, along with the Docker command-line client. This Command-Line Interface (CLI) is what you typically work with when developing with Docker. 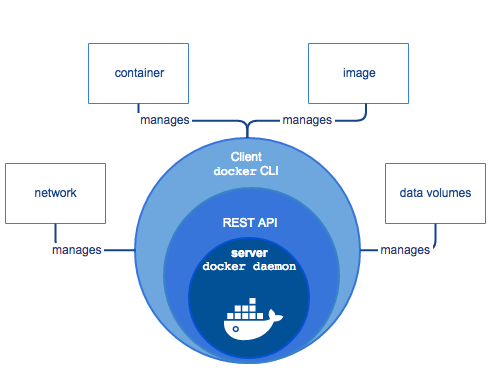 The client communicates with the host Docker program via an HTTP API, so the included Docker CLI is just one possible client of Docker Engine. 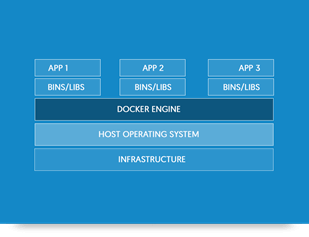 The installation process for Docker varies depending on your target platform. To install it on your local development machine, you can typically use Docker for Windows or Docker for Mac. Instructions for Linux depend on your distribution. Note: Both installation methods have specific operating system requirements, so check the Docker documentation before proceeding. Also, if you use VirtualBox for other day-to-day work, you may want to check out the legacy installation method for Windows and Mac: Docker Toolbox. Docker Toolbox differs from Docker for Mac and Docker for Windows in that it sets up a Linux host in a VirtualBox VM and installs Docker Engine there. The native installers use newer virtualization technologies that allow Docker Engine to run a little "closer to the metal" and can be more performant. The installation instructions on the Docker website typically also include a step to run a hello-world container. Go ahead and try this to verify everything works. When you can successfully run the hello-world container, proceed with the rest of the guide below, where we get to work with different components of Docker. The Docker CLI tells Docker Engine on the host that you want to spin up a container from an image called "hello-world". Docker Engine on the host looks for an image by that name in its local cache, and failing to find one, it reaches out to known Docker registries to look for it. The default registry is Docker Hub . Finding the image on Docker Hub, Docker Engine downloads a copy, and executes it in the host environment. Output from the container is streamed to the local command line. The main process inside the container terminates, signaling Docker Engine to stop the container. The hello-world container stops immediately because it does not host a long-running process. Many containers kick off a process that is meant to stay running. For example, databases and web servers are common long-running processes because they need to keep listening for new connections or requests. In the following examples, we’ll work with nginx, a lightweight web server. The nginx Docker image starts the program in such a way that it doesn’t terminate immediately. In this case, Docker Engine leaves the container up and streams logs to our console. We can try this by running docker run --rm -p 8080:80 nginx from our command line. This time, when we ran a container, we provided two additional options to the Docker run command: --rm and -p 8080:80. The --rm option tells Docker Engine to remove the container when it stops. This isn’t a required option flag, of course, but it’s a good habit to get into in order to keep our Docker environment clean. Containers are meant to be thrown away. 192.168.99.1 - - [07/Feb/2017:16:01:08 +0000] "GET / HTTP/1.1" 304 0 "-" "Mozilla/5.0 (Windows NT 10.0; WOW64) AppleWebKit/537.36 (KHTML, like Gecko) Chrome/56.0.2924.76 Safari/537.36 OPR/43.0.2442.686 (Edition beta)" "-"
Here, we can see several key properties of the container, including the image it’s from, exposed and mapped ports, and a name Docker assigned to the image. We can customize the name by adding an option flag such as --name my_nginx_container to our Docker run command. Now, let’s stop our container by running docker stop vigilant_lamarr. Make sure to use the container name we retrieved from the console output of docker ps. If we run docker ps again, we should see an empty table. Images like nginx that execute a long-running process are meant to be run with the -d option flag. This starts the container just like before, except Docker returns us to the command prompt immediately without streaming the logs. We can still access the logs from a container by running docker logs vigilant_lamarr (again, remember to use your container name). Some images are meant to be run as interactive containers with the flags -i and -t. For instance, what if we want to work on a base Ubuntu image from the command line to try out a couple of utilities? We could launch an Ubuntu container straight into bash with the command docker run --rm --name ubuntu_test -it ubuntu bash. When Docker finishes downloading the image, it reads the last argument we provided and starts that program for you in the container. In this case, we’ll be launched into a bash terminal with root privileges inside the container. Note: On Windows, you may need an alternative terminal to successfully run an interactive container. Try using Cmder with the full installation. You may need to manually set Docker environment variables for your Docker CLI to work properly. You can use the docker-machine env command to print out the variables and values you need to set. We can go ahead and try out a few commands (e.g., whoami, ls, apt) and, when we’re done, we can run the command exit. Now we’re back in our local command line. We can run docker ps to check the status of the container we just ran. The container should not actually be listed here. Remember how we executed docker run with the --rm? When we ran exit from inside the container, the bash session ended, signaling Docker to stop the container, and the --rm option informed Docker to remove the container also once it stopped. 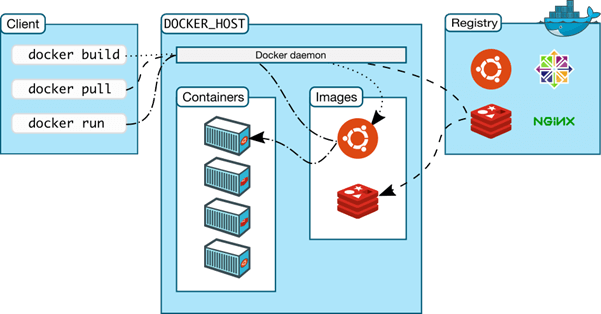 Now that we have Docker installed and are familiar with running a few types of containers, we can take the next step by building images and learning about container orchestration. The next article in this series covers both of these topics. In the meantime, try substituting a Docker container for one of your applications dependencies, such as a shared cache, messaging service or database. If you look into databases, make sure to read up on managing data in Docker volumes to persist your database between container instances. This article originally appeared on April 20, 2017. Do I need an account to use Insight’s website?